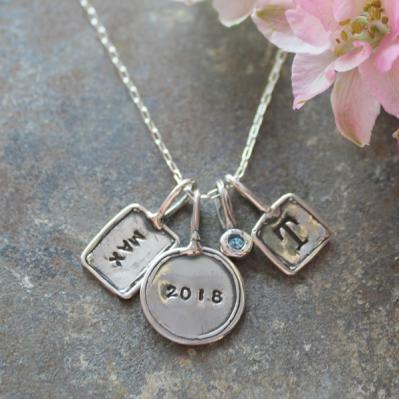 "Personalized Charm Necklace, Trinket Charm Necklace in Silver"
Design a unique and beautiful necklace mixing shapes of silver charms to create a stylish and meaningful accessory you will love. You are the designer so show us your talent! Price includes a 16" sterling silver chain and one stamped charm. If you change lengths or add charms the price will change. We love simple and organic and this necklace embodies both! Select the shapes you like and add a cross, heart or some birthstones to create a necklace that is meaningful to you. Unleash your inner jewelry designer and create a piece that you will cherish! All silver is sterling. Charms range in size and vary between .5" and .28" in size. Crystals are Swarovski.